This is a guest post from Jacki Dilley of Money. Work. Life. I have a clear memory of getting off the bus on the last day of first grade. I was struggling down the steps with a huge grocery bag full of stuff that had been in my desk, and also carrying a prize I had won. Just as I got off the bus, I dropped the prize. The bag was ripping, so I couldn’t set it down and pick up my treasure. Even so, I felt I had the situation well under control, and couldn’t understand why my mom came running up to my rescue. That scene still repeats itself more often than I wish, except that my mom no longer appears. I have so many wonderful things in my life: my loved ones, a vibrant spiritual community, good things to read, people who laugh at my jokes. And just yesterday I realized that once again I was trying to convince myself I had my overflowing shopping bag under control. I’m not having fun with this. I don’t see how I’m going to catch up with several important neglected tasks at this rate. I’m starting to hate writing. Other marketing efforts would be more effective at this point. Actually, business is going well, and marketing isn’t my top priority right now. I’ve given my own blog almost zero attention in the past six weeks. Did I mention I’m not having fun with this? It had happened once again. I had seen bright, shiny objects. I stuffed them into my shopping bag. The bag started to rip, but I didn’t want to let go of a single thing that I’m interested in. And then my peace of mind hit the ground. Rather than simply cutting back with the new writing gig, I’m tempted to just chuck it. But that would be dumb. Sustainable abundance comes about through mindful decisions, made over time. Trying to simplify life by alternating between over-committing oneself and hacking away at the mess is so last year. I am reminded of the gray October afternoon during my first semester of college when I was standing in the stacks of the graduate student library, surrounded by 18 trillion or so books. I had spent the last hour reading sections out of volume after volume: The Three Christs of Ypsilanti, Coming of Age in Samoa, you name it. The more I read, the less satiated I felt. Then it hit me: I will never be able to read all the interesting books I want to read. I checked out the books I needed to write my paper and went home. And I felt at peace. Jacki Dilley is a psychotherapist in Ann Arbor, Michigan. 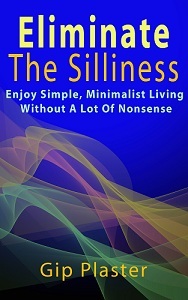 She writes about living consciously at Money. Work. Life. and about the process of healing and change at Jacki Dilley — Thoughts on Therapy. All that glitters is not gold was the saying that jumped to mind. The shiny bright object that fascinates often disappoints because it is worthless except to our ego that adds a perceived value to it. What would we do without our moms? How many times did they save you from pain or humiliation? A person that we value but often don’t appreciate their attention in our lives, especially when we are young and know it all, and then they’re gone. So many things we want to do in life but how many are important? It’s tough trying to sort out what we really need from what we think we need especially when they are bright and shiny. The peace in your heart is the best umpire in making those decisions because emotions are fickle. Weigh up the pros and cons and then measure them against your goal of a simple life. Thanks for being the first to comment on Jacki’s guest post, Andre. Would you like to write a guest post for me sometime? My Guest Post Wednesdays offer (mentioned in a previous post) is still available, although there have been very few takers. The offer is available to everyone, actually. Let no opportunity go unseized. And lose your mind. It takes a firm sense of priorities to turn down what looks like a great opportunity. But the thing is, life is just full of opportunities and it’s just fine to leave some of them for someone else. (Abundance thinking 🙂 Good post, thanks for reminding me.